Good news for haulage providers! 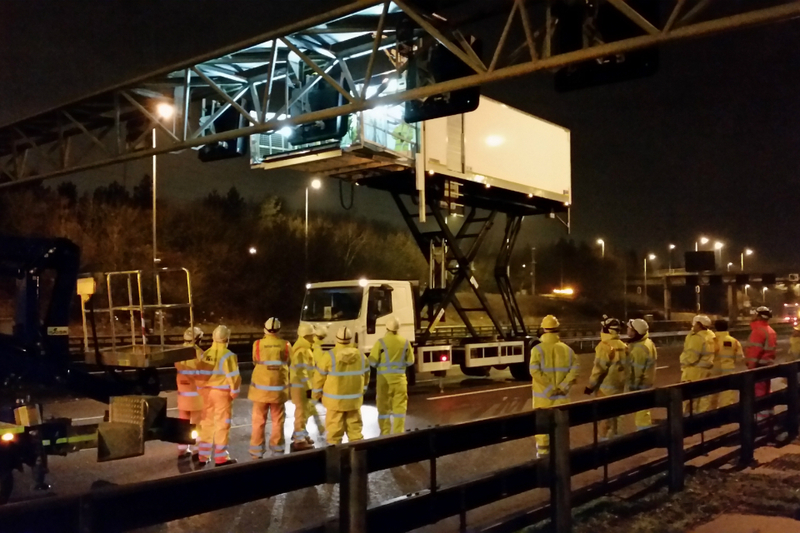 A type of vehicle to help replace overhead signs on the roads is set to be used to lower the duration of roadworks, offering a saving of up to £4 million of the tax payers money per year – and meaning less time in traffic. The vehicle is modelled on the design of an aircraft catering vehicle that allows the loading of refreshments onto the vehicle, which is then lifted with use of a hydraulic scissor lift to the level by which it is required to make the maintenance change. While offering a huge saving, it will also mean that road workers won’t have to close as many lanes. Using the new Maintenance Assistance Vehicle will ensure that less space is needed on the road way, which essentially means less disruption to drivers, minimising their drive times. Normally, road signs are taken down and put up with the use of a flat-bed truck, crane and cherry picker, of which each takes up to 40 minutes of man labour. The ‘Maintenance Assistance Vehicle’ that has already been trailed and deemed a viable option, only takes half of the time and uses just a small jib crane – which is already a part of the vehicle. The MAV is not only considered a more economic and time effective method, but moreover is categorically safer for the workers. The MAV provides a sturdy platform whereby the worker can work within. With the breakthrough in this device, many are debating other uses for such a vehicle to further save money and time, while improving safety for those at work. As safety is an ongoing hot topic of all types of industry, any slight improvements that can be made anywhere are always seen as an important and worthwhile change to make. Nobody should be put at risk when working, thus creating such processes that ensure a safer level of work will be granted. When the platform of the MAV has been raised to the sufficient height, the jib crane is carefully attached to the sign of the gantry and is lifted off. The sign is then detached and put onto a trolley on the platform and placed into the main compartment of the vehicle. Allowing a height access of up to 8.5 metres and operable in wind speeds up to 47mph, the MAV could prove to be a real winner looking ahead at the type of exercise. Equipped with CCTN camera that and monitors that will allow real time tracking of what’s going on and the positioning of the vehicle, the MAV will undoubtedly speed up the process. Initial tests were carried out on fully closed carriage ways, though following the success of it, will be tested gently on part closed carriage ways to ensure that everything goes to plan. This could mean improvement for haulage providers Cheshire, as the roads will have less congestion even in times of roadway maintenance, ensuring speedier deliveries!